Thrilling action and stealth gameplay enhanced by the Fear system, an exciting story and ultra-stylish cutscenes. Harness your team’s dynamic abilities to tackle enemies and puzzles like never before. This is the quintessential sequel for existing fans and a perfect starting point for newcomers. The Fear Effect: When your fear meter rises, you will be more susceptible to injury but will receive a boosted damage output and special abilities. Deny fear with stealth and strategy through the new isometric viewpoint and Tactical Pause feature. Enter the spirit realm: Encounter mystical forces of the Inuit and supernatural creatures of the spirit realm. Will you dare to face the unexpected? Cinematic cut scenes: Striking animated visuals bring life to a wild, engaging story and dynamic characters. An array of weapons and character abilities: From silenced pistols and defensive turrets to flamethrowers and monstrous transformations! A real-time tactical action game: Exploit your heroes special abilities, and combine them to maximize your team's effectiveness in attacks. Fear Effect Sedna © 2017 Square Enix Limited. All rights reserved. Developed by Sushee SARL. Published by Square Enix Limited. 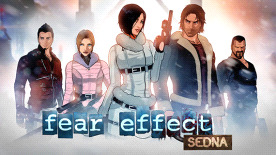 Fear Effect, Fear Effect Sedna are trademarks or registered trademarks of Square Enix Limited. Square Enix Collective and the Square Enix Collective Logo are trademarks of Square Enix Holdings Co. Limited. Sushee and the Sushee logo are trademarks or registered trademarks of Sushee SARL. Forever Entertainment and the Forever Entertainment logo are trademarks or registered trademarks of Forever Entertainment S.A.